The conference on 31 July 1940 formalised the effort to prepare operational studies for war against the Soviet Union. Major-General Erich Marcks, 18th Army Chief of Staff, had already been working on contingency plans for war that would become a principal cornerstone in the theoretical foundation of the final Barbarossa. Marcks plan, entitled “Operations Outline East” (Operationsentwurf Ost), was completed in the first week of August. The plan envisaged two main thrusts: one to the north and one to the south of the Pripet marshes. The stronger of these two pincers was to be stationed in the north striking from East Prussia and Poland as Marcks, at Halder’s urging, determined Moscow to be the decisive key to ‘eliminating the coherence of the Russian state’. To achieve this, more powerful northern army group should take the most direct approach to the Soviet capital, using one of the best road systems in the country, which proceeded via Minsk and Smolensk through the Orsha corridor between Dvina and Dnepr rivers. A secondary force would break off from the main group to strike north and seize Leningrad via Pskov. In the second theatre of operations south of Pripet marshes, the objective was to prevent a Soviet advance into Romania (vital oil supplier) by advancing on Kiev and middle Dnepr. 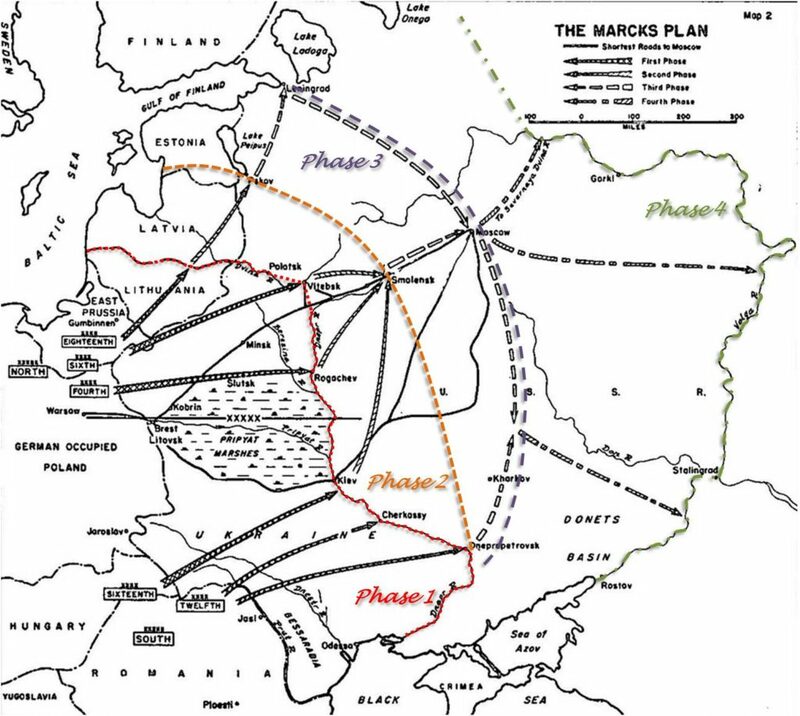 The campaign was to embody four phases through which Marcks hoped to achieve final victory (see picture). The first phase was thought to require ~3 weeks and involved pushing back the vanguard of the Red Army to their older fortified lines of defence, roughly ~400 km from German starting positions. Failing preventing withdrawal of Soviet large-scale formations, second phase would be necessary, requiring the breakthrough and encirclement of the Soviet defensive positions extending to a distance 100-200 km more (~2-4 weeks). The third phase was predicated on the success of the 2nd. Its objective called for the simultaneous advance on and capture of Moscow, Leningrad and the eastern Ukraine (~3-6 weeks). The final stage was the occupation of the Soviet Union up to the Don, middle Volga and upper Dvina. No serious opposition was expected, so the phase was even termed “railway advance” (~3-4 weeks). Marcks believed the Soviet strategic response would suffer from fundamental dilemma. On the one hand, the might wish to adopt a strategy similar to 1812, and fall back into the depths of their country. But being unable in a modern war to abandon lines of supply and sources of production, Marcks concluded, they would be forced to hold a defensive position in the western part of the country. The Red Army’s strength was estimated to be 151 infantry divisions, 32 cavalry divisions and 38 motorised brigades. German strength for the invasion was aimed at being 110 infantry, 24 panzer, 12 motorized and 1 cavalry divisions (not including western occupation forces). In the following weeks Marcks’ reflections on the possible outcome of war created a new study named “Evaluation of Situation Red” (Beurteilung der Lage Rot), which envisaged quite different outcome comparing to the initial analysis. He foresaw an enemy coalition between Britain and USSR that would be shortly by the United States. This would put the Axis in the grip of powerful blockade, so the Soviets would just have to ensure their survival against initial German blow to take advantage of the collective power. These could arise towards the end of 1941. Such a scenario placed great emphasis on defeating the Soviet Union quickly in order to eliminate a dangerous enemy and ensure Germany’s economic survival. Pre-emptive Soviet attack. He discounted it on military grounds, while acknowledging that a degree of risk existed to Finland and Romania. Most likely estimation: Red Army would mount a vigorous defence of its western borders. Soviets would revert to their 1812 strategy of withdrawal in depth, meeting the Germans only where necessary as rearguard actions. This also viewed as improbable owing to the economic importance of Ukraine which couldn’t be abandoned according to Lossberg judging. As Red army was expected to hold the line near the border, Lossberg plan called for three simultaneous thrusts into the Soviet Union, each directed by its own army group and deployed to the north (two groups) and to the south (one group) of the Pripet marshes. Of the two northernly army groups, one would attack through the Baltic states, across the Dvina towards Leningrad, while the second and most powerful group would proceed due east towards Moscow with encirclement battles centered on Minsk and Smolensk. For the southern group Lossberg envisaged two main areas of concentration, one striking from southern Poland and the other from Romania along the northern shore of the Black Sea. The goal was to enact a double envelopment of Soviet forces between the Pripet marshes and the Black Sea, eradicating resistance before attempting a crossing of the Dnepr. He also stated that without the use of Soviet railways to facilitate the latter stages of the advance, ‘a transport system based only on roads would be insufficient’. Just as Marcks had done, Lossberg’s plan never questioned the ability of the Wermacht to achieve victory and he believed it was impossible that Russia can remain capable of resistance after losing her western territories and contact with the seas. His outline of the campaign contained no timetable.